For over two centuries, the Delamotte Champagne House has been crafting some of the most enchanting and exquisite champagnes in the heart of the Côte des Blancs in Le Mesnil-sur-Oger. The precise style of these champagnes have caught the attention of acclaimed wine writer Karen MacNeil who hails Delamotte’s Blanc de Blancs as her “desert island” choice. Whether you’re enjoying Delamotte Champagne in a solitary moment or sharing it surrounded with family or friends, the House promises every moment with it champagnes to be one of elegance, finesse and exquisiteness. 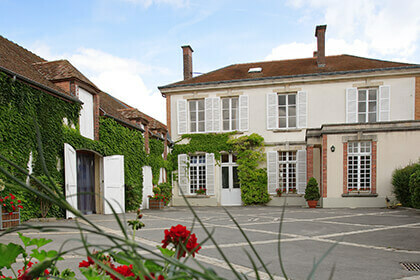 Located in one of the finest Champagne villages, Le Mesnil-sur-Oger, Delamotte Champagne overlooks its some of its vineyards dotting the gently rolling emerald green hills of the prestigious Côtes des Blancs. 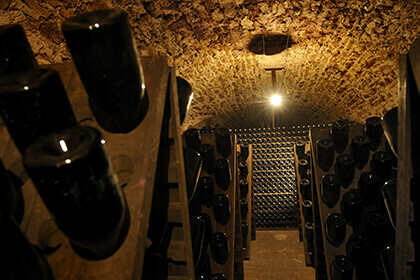 François Delamotte founded the Champagne House under his own name in 1760, and this makes it as the fifth oldest Champagne House in the region. Since then, Champagne Delamotte has had quite the illustrious history with its earliest beginnings associated with coronation of the King of France. It was Nicolas Louis Delamotte who took over the House in 1828 who rose to fame for organizing the coronation festivities for the King Charles X in Reims. The House continued to change hands over the next hundred years before Marie-Louise de Nonancourt inherited it in 1924 – this was the start of the Nonancourt family reign over the House. One of the House’s historical turning points occurred when Charles de Nonancourt was at the helm from 1948 to 1988. He put forth two golden rules that have been the core of the House’s approach to champagne making: limited production to guarantee constant quality and never less than three harvests ageing in the cellars. In 1988, Bernard de Nonancourt, the older brother of Charles, bought Champagne Delamotte, and the House went through another critical phase in its history. Under his leadership, it became part of the Laurent-Perrier Group and associated with the prestigious Champagne Salon. It’s no surprise Delamotte merged with the Group since Bernard actually started his career with his brother at Delamotte before he took over the Laurent-Perrier House in 1949. Since 1997, Didier Depond has been at head of Champagne Delamotte and the Laurent-Perrier Group. He believes “a great champagne is first and foremost a great wine”, and this ideal continues to embody the Delamotte House. 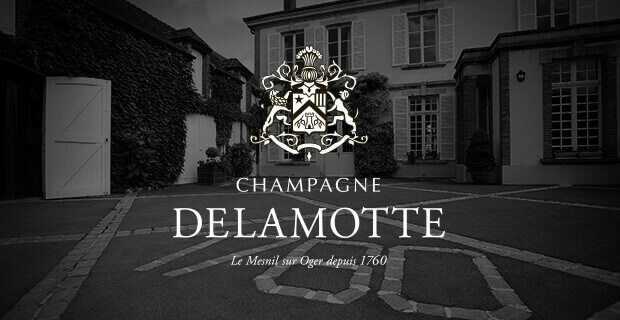 Delamotte Champagne’s elegant and distinctive styles spring from some of the greatest terroir in Champagne. 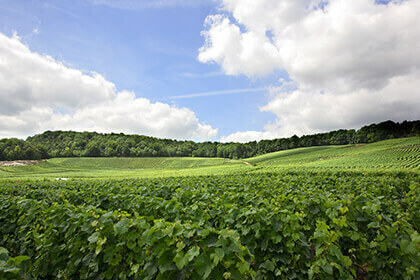 These vineyards are the key that unlock Delamotte’s unique expression of Chardonnay and Pinot Noir, which are mostly situated in Champagne’s sub-regions of Côtes des Blancs and Montagne de Reims. The Chardonnay grapes ripen in the acclaimed Côte des Blancs Grand Cru vineyards in Le Mesnil-sur-Oger, Oger, Avize and Cramant. The Pinot Noir berries are from the famed Montagne de Reims Grand Cru plots where they flourish on the south-east slopes in Bouzy, Ambonnay and Tours-sur-Marne. All of these vines grow in Champagne’s renowned chalky soil. Since it is highly porous, it’s perfect as a reservoir for the vines that can maintain a steady supply of water even during the driest summers. Yet at the same time, the vines get a little stressed trying to get this water, so this access to water and stress to get it allows the berries to reach a perfect balance among ripeness, acidity and aromas. Once these grapes are harvested, they then each play a specific role in the Delamotte champagnes. 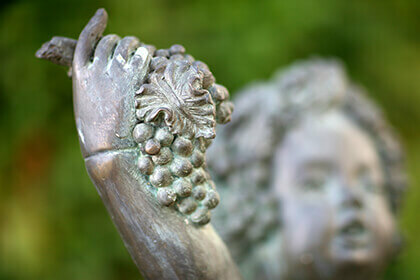 Chardonnay gives elegance, finesse and minerality while Pinot Noir brings structure and helps with ageing. In some champagnes, you may also find hints of Pinot Meunier, which contributes softness and harmony. This chessboard of vines offers refined champagnes full of complex and concentrated aromas and flavours. Under the expertise of Michel Fauconnet, Delamotte Champagne’s Cellar Master brings forth the most authentic expression of the grape varieties and terroir. 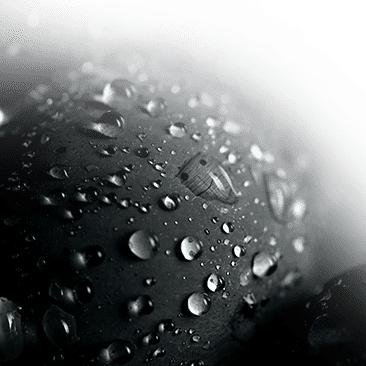 These champagnes are noted for the purity of their fruit, and this is possible since the House uses a very restrained dosage so that the fruit flavours aren’t altered. Also, Fauconnet uses no more than 10 percent of reserve wines in blending so that all the personality of the grapes remains and that all the chalkiness of the terroir shine through in each drop of champagne. You can find your fluted glass bubbling with a Delamotte Champagne brimming with elegance and exquisiteness. Among one of the most refined is the Delamotte Champagne Rosé. It is perfect composition of 80% Pinot Noir and 20% Chardonnay with a pale pink colour that offers a delicate bouquet of red fruit like strawberries and raspberries. The three to four years ageing on lees also adds notes of toastiness and creaminess. The refined palate is nothing but finesse enveloped in a lovely, smoky minerality. The Delamotte Brut Champagne is an exquisitely elegant blend of 55% Chardonnay, 35% Pinot Noir and 10% Pinot Meunier. It enchants with its dazzling light golden colour and then entices with its white flower and citrus aromatic bouquet. The 30 to 36 months of lees ageing gives toast and creamy notes. The palate offers the most delicate effervescence with pure fruit and freshness to give a perfectly balanced champagne. It goes without saying that the Delamotte Blanc de Blancs is a pure delight from 100% Chardonnay grapes. The captivating golden colour shimmers as its delicate floral, citrus and biscuit aromas overflow the glass. The four to five years spent on lees gives the wine a refined maturity. The palate combines roundness and chalky mineral notes to reveal a wine of great finesse. An additional two to six years will allow this champagne to offer its full personality to the most patient wine lovers. The motto “live and love me” adorns the arms of the Delamotte family. How could any wine lover not live for the pleasurable moments Delamotte Champagnes brings to life, and love their timeless elegance, finesse and exquisiteness?